Pili (Canarium ovatum Engl.) is a promising crop of Bicol which has a great potential for development as a major export crop. It has a wide adaptation to varying agro-climatic conditions. It can be grown alone or intercropped with other crops. Like the coconut, Pili is a tree of life, with all its parts being useful. It thrives satisfactorily in maginal soil conditions, harsh tropical climates and in low as well as high elevation. It is resistant to typhoons and most pests. The tree reaches a height of about 20 to 25 meters and a diameter of about a meter or two. * When roasted and ground, it is used as ingredients for ice cream, salads, puddings, toppings for cakes, bread, pastries, confectioneries and other delicacies like marzipan, fruit-cereal bar, fruit and nut mix, chocolate -making; can be eaten raw or processed as roasted, fixated or sugar-coated and is served in the same way as cashew or almond, or peanuts. * Vegetable dishes, pickle, oil (for cooking and lighting), feeds for cattle and swine. * Trunk produces a resinous substance commercially known as “Manila elemi”, a valuable material in the preparation of varnishes and lacquers. * A volatile oil extracted from the trunk is used for numerous purposes and can be a substitute for turpentine. * The wood is characterized by fine straited grains making it very ideal for the manufacture of high quality furniture, wood panels, carved doors and other wooden products. * The tree sap is an abundant source of natural resins, essential oils, and possibly, insect repellant. A kilogram of pili nut has about 700 grams of oil, which by proportion, is 70%. The pili kernel oil has almost the same fatty acids as that of olive oil, and at the same time, that of cocoa butter. Pili thrive best in areas where rainfall is almost evenly distributed throughout the year and in sandy loam soil rich in organic matter and in volcanic soils. Being a hardy tree, however it can also grow in marginal lands. It can grow in steep hillsides and even under coconuts. There are two ways of propagating pili seedlings, sexually or asexually such as marcotting, grafting and budding. Pili is generally propagated by seeds. It is a delicious tree, meaning that the male and female flowers are not present in the same tree. The female productive trees are only known at fruit-bearing age and the seeds from the bearing trees will not necessarily be totally female. * Average seedling trees start fruiting 5 – 6 years after seed germination. Asexual propagation on the other hand is preferred because it ensures uniformity and true-to-type characters of the selection. It is early maturing 2-4 years. This method also assures uniform plant structure to facilitate cultural management operations. It also enables planting of more productive trees per hectare. Cleft grafting and inarching are recommended for propagating pili asexually. Success ranges from 50-85% depending o the physiological state of mother trees and propagators skill. Grafting operation is usually done in November to February Cleft grafting technique is now proven successful, relatively easy and is gaining popularity for large-scale commercial propagation. In backyard planting, farmers dig holes just wide enough to give ample room for seedling and to prevent trapping water, especially when soil is heavily textured. In utilizing second-growth forests (less the stumps and existing trees), holes are aligned in all directions as mush as possible. If open lands previously utilized for other crops are to be used for planting pili, deep plowing is done to expose and loosen the soil followed by several harrowing until the desired tilth is attained. * Underbrush tall shrubs and grasses and remove big stumps and fallen trees to facilitate plowing, harrowing. Fallen trees serve as alternate host of insect pest and diseases. * Plow once and then harrow once or twice depending on the prevalence of weeds. Remove stumps of big trees or shrubs, especially if they obstruct in the laying out of the area. * Row clear if the pili orchard is to be established under coconut in addition to plowing and harrowing. Periodic underbrushing and ring weeding must be done whenever necessary. Usually these are done once every quarter in areas with frequent occurrence of rain. The size of cleaning around the tree should be as wide as the spread of the crown. For orchards which used seedlings, it is advisable to top cut the plant 1-2 years after planting to induce the growth of lateral branches. Top-cut trees usually grow low and more bushy and afford easy harvesting. Orchards with asexually propagated plants do not need to be top cut. Only occasional pruning of damaged branches should be done. After cutting or pruning, paint the wound to protect it from being invaded by wood-boring insects. It will also prevent the entrance of unnecessary moisture. Intercropping is practiced while the pili trees are not yet productive. Small fruit crops that are adapted in the area are planted such as banana, papaya, pineapple or annual field and vegetable crops. These crops will provide income that can be used to maintain the area, while the pili trees are still unproductive. Furthermore, cash crops require cultivation such that clean culture of the orchard is ensured. Residual effect of the fertilizer applied to the cash crop will also benefit the pili trees. Intercropping, however, should be stopped when the canopy of the trees are already close to each other that it might interfere with orchard operations. Although there are no study yet on pili-based cropping system, the survey of existing plantation shows that pili trees are compatible with a wide variety of plants. Hence, intercropping pili trees with pineapple or other fruit trees will be beneficial provided that sufficient amount of sunlight could penetrate of both the pili and the intercrop. The most common pests are the twig borers (Niphonclea albata News) and (Niphonoclea capito Pasc.) and gray mealy bugs (Ferrisia virgata CK 11.). “Tiyangaw” a rice pest, was also observed. Borers hatch inside a stem eat anf grow there as caterpillars. The presence of borers is indicated by the sudden wilting of plant tops. Pest attack can be controlled by spraying with insecticide. Occurrence of pest attack and diseases is negligible so as to cause concern. Harvesting is usually done during the months of May to October. 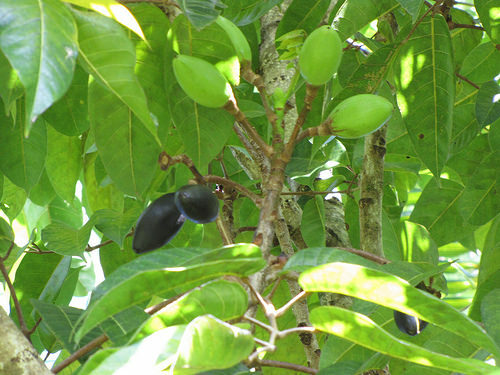 The maturity index for pili nut is the full purplish black pulp of the whole nut. Pili fruits in cluster do not mature at the same time. Therefore, harvest only the ripened fruits. Harvesting matured fruits is done by priming or picking only the ripe fruits. A long pole, a cutter or knife and a basket may be used. Harvested fruits are placed in baskets or sacks. If the pulp of the fruit is intended to be sold for food purposes, harvesting is done late in the afternoon or early in the morning and placed in a well aerated container to prevent softening of the pulp. To facilitate the gathering or collection and for high recovery of fallen fruits, the following strategy can be done. 1. Pulp Removal – Four methods of depulping are practiced. a. hot water treatment (HWT)– Heat the water in a vat until 60°-70°C. Put off the fire. Place fruits in the vat and stir constantly to keep its temperature uniform. Leave fruits for about 15-30 minutes to soften the pulp. Drain water. Cool fruits and peel manually. b. Pounding using a wooden mallet– The fruit is pounded until the pulp is separated from the shell. This is the simplest and most economical since the depulped nuts are no longer washed and are directly dried under the sun. c. Retting method– This is used in a commercial scale, where the fruits are soaked in tap water from 1-2 days until the pulp softens. d. Fermentation method– Fruits are kept is sacks or polyethylene bag and left from 1-2 days under shade to soften pulp. The pulp softens because of its moisture and higher temperature inside the sack. 2. Washing and Drying– After depulping, wash the nuts in clean water to remove the slimy material adhering to the shell. During this process, discard all nuts that float. Floaters are either unfilled or devoid of kernel. After washing, nuts are dried under full sun for 2-3 days sufficient enough for pili nuts to be stored for at least a year. Nuts should not be dried for more than three days to avoid shriveling of kernels. During cloudy days, nuts may be dried longer for about 4-5 days. 3. Storage– Pili nuts can be stored either shelled or unshelled. Most processors place the nuts in clean sacks which have a capacity of about 50kg. Stack sacks in pallets and store in a well-aerated room. Sacks should not be in contact with the walls of the storage house to prevent contact with any moisture. A regular inspection prevents rat and insect infestation. Indigenous materials such as cardboard boxes are more durable and result in lowest number of rancid and shriveled kernels after a year of storage. 4. Shelling– Kernel is extracted manually. Cut the shell crosswise at the middle portion with the use of a sharp bolo. After cutting the shell in two, remove the kernel carefully and place in a clean collection box or plastic basin. Great care and skill are required and the cutting stroke should be controlled to prevent cutting through the kernels. 5. Seed Coat Removal– The brown seed coat or testa sticks tightly to the kernel. To peel, blanch the kernels with the boiling water for about three minutes and cool for easy removal of testa. Squeeze the kernels carefully to slip off the testa. The clean kernels are air-dried and packed in plastic bags prior to processing into various food preparation.